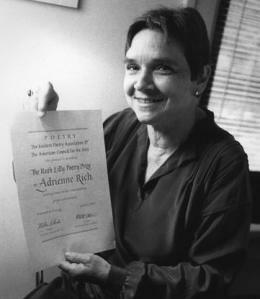 On Wednesday I found out the great American poet Adrienne Rich, 82, past on the day before. Many expressed disbelief and sadness on Facebook. I wasn’t too shocked or sad. I recently learned about Rich from my friend Marcia who was a big fan and gave me two books written by Rich. Reading about Rich these past few days has me sad that a poet died; a poet who spoke truth; a poet who fought for the underdog; a poet who opened doors for young writers like me. Rich was bold and had integrity. She left her husband so she could live the life she wanted to live, and she didn’t just write about having a certain politic, she practiced it. In 1997 she refused the National Medal for the Arts given out by the President of the United States who was then Bill Clinton. Five years later, 2003, Rich refused to partake in a poetry symposium held at the White House in protest of the U.S led invasion of Iraq. Rich matched her art with her politics. She was a proud lesbian, feminist, and socialist who stamped her beliefs in print. Rich started teaching underprivileged kids in New York and then taught at prestigious universities and colleges such as Columbia, Stanford, Rutgers, and Cornell to name a few. Born in Baltimore and living her las days in Santa Cruz, Rich leaves behind three children and a huge legacy. “You must read Adrienne Rich!” said my friend Marcia when giving me 45 books last month, two being Adrienne Rich’s Poetry and Adrienne Rich: Poems Selected and New 1950-1974. I’ll start with these two and then move on. poetry, music, interviews, vlogs, roundtables, and workshops. This entry was posted in Poetry and tagged "What Kind of Times Are These" by Adrienne Rich, Adrienne Rich, Adrienne Rich 1929-2012, Adrienne Rich dies, Adrienne Rich poetry, Black Coffee Poet, Feminist poetry, https://blackcoffeepoet.com/, lesbian poetry, Queer Poetry, RIP Adrienne Rich, Socialist Poetry. Bookmark the permalink. Your love of books is shared! Thanks for standing with the public library folks! The poem you featured here is the same as on the Democracy Now! coverage ( http://www.democracynow.org/2012/3/30/adrienne_rich_1929_2012_alice_walker ) on the passing of the poet, Rich. Coincidence? Regardless, you are providing quality and necessary insight! I’m glad to see the other comment here as well, a bit more critical of Rich’s perspective. While I have never seriously delved into Rich’s work myself, and so remain relatively unbiased as to her reputation, my reaction is that when it comes to diverse sexuality and the act of embracing multifarious gender distinctions, which define us respective of our orientation, such matters of distinction are increasingly blurred with greater awareness.